Four Tines and a Napkin: Toasts | 2nd blogiversary! Two years ago today, I found a little home for myself here at Four Tines and a Napkin. I've learned so much over the last two years of writing, sharing, documenting, researching, and shooting food, activities bon vivant, and all such things that perpetuate my love for gastronomy, gourmandise, and epicurean delights. All this learning includes (but isn't completely limited to) writing better, shooting better, cooking better, eating better, and sharing better. I can't believe I've come this far since that very day I decided to make my musings and ruminations not only public but shared regularly. I can only hope that I continue to become a better storyteller in writing and in photographs. It means so much that you all take interest in my adventures as a morsel marauder and a seeker of culinary and gastronomic knowledge. So a big thank you to all my readers for coming on this journey with me -- I wouldn't be here without you! Here is a little milestone cake I got for myself to celebrate from Lady M topped with some gold sparklers from Sparkle with the East River as the backdrop. Finally put our balcony to some good use -- love this shot! 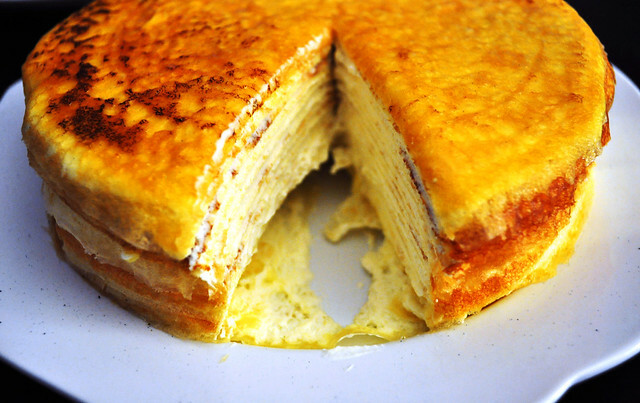 Lady M's signature mille crêpes cake has twenty paper-thin handmade crêpes layered with light pastry cream. So delicately delicious -- can't go wrong with several layers of crêpes and cream! Undoubtedly one of my favorite slivers found in this luminous city. Thanks to Marcus and Lisa for celebrating with me (and helping me finish the entire cake, of course :P)! 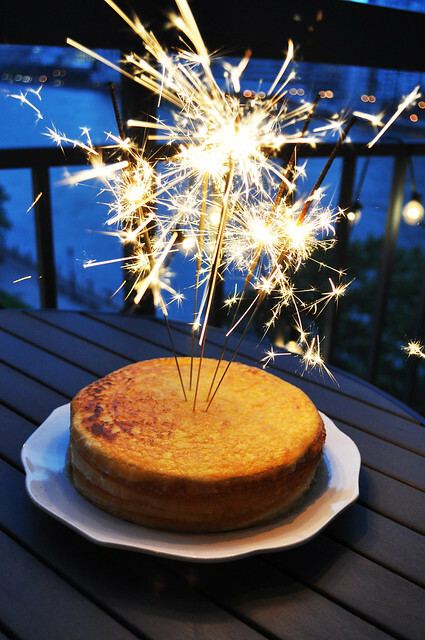 Price point: $40 for a six-inch mille crêpes cake from Lady M, $45 for 288 ten-inch sparklers from Sparkle. Must order: any of the cake shop's mille feuille/crêpe cakes. It is such a marvel to behold and taste every single time I go to have a sliver.